TSR injury Law represents victims of the salmonella food poisoning outbreak which occurred at Great Moon Buffet located on Robert Street in St. Paul. This outbreak occurred in late June 2018 and sickened numerous persons. If you or a loved one were a victim of this food poisoning outbreak or any other outbreak, it is TSR Time! Call us today at 612-TSR-TIME. Salmonella is a bacteria that makes people sick. It was discovered by an American scientist named Dr. Salmon, and has been known to cause illness for over 125 years. The illness people get from a Salmonella infection is called salmonellosis. How Common is Salmonella Infection? 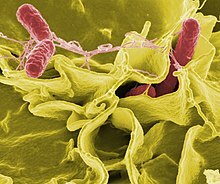 CDC estimates Salmonella causes about 1.2 million illnesses, 23,000 hospitalizations, and 450 deaths in the United States every year.2 Among these illnesses, about 1.1 million are acquired in the United States. Among the illnesses acquired in the United States, CDC estimates that food is the source for about 1 million illnesses, 19,000 hospitalizations, and 380 deaths.